A Prefect rides with his son, Arno, and gorilla soldiers to the location of the spaceship crash. You’re not to say a word about this. It’s dangerous. Humans know their place, and that mustn’t change! If they ever learn that other humans were able to build and fly a machine like this, they’ll begin to think they’re as good as we are. But father, look, these humans must be better than we are. I found this cave two years ago. I never told anyone. You’ll be safe here. The apes, of course. I’ll be back as soon as I can. (flatly) That’s what the man said. 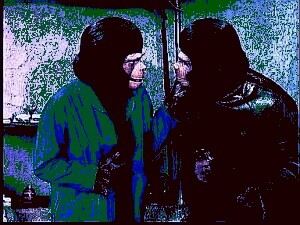 (speaking of the astronauts) This is an infection, Zaius! One doesn’t question it! One wipes it out! I’ve been thinking. The input record of our flight is still on the spaceship. Everything that happened from the time we left home until we landed back here on Earth was recorded on that magnetic disk. All we have to do is run it through a computer, analyze what went wrong, reverse the process, and maybe we can get back home again. To do what? Build a spaceship? And a computer? Do you realize that possession of such a book, alone, is punishable by death? Why, Zaius? Why should truth be against the law? Was there ever a time when humans controlled the world, and the apes were kept behind bars? I said you had much to learn, but that didn’t include heresy. Maybe they were right, Zaius. Maybe the world would be better if no creature controlled another, if all worked together as equals. Yes, I know! You’ll destroy me as your kind once destroyed the world! Your science and your machines – very few know your history, and very few will ever know. And your cities! Death and destruction! We don’t want them! We don’t even want their memory. Yes, you did it to yourselves, as you would do it again. That human was caught trying to sneak into the city. And yes, I had him killed. As I will have you killed some day. As I must have poor Galen killed. The infection you carry is fatal. There were some who wouldn’t kill for any reason. Pacifists. They figured human life was just too special. I’ve never understood the need to kill. It’s a thing for humans. This is Galen. My friend. (talking to his father about his mother) She said there was no honor in killing. She said. But she loved me. She never would have noticed me if not for the games. I would have been nothing except for the games. How many men have you killed, father? The Prefect created the games and they brought peace to the village. As many as I have fought. I'm afraid the games died with him. Perhaps there is a better way to govern. Tell your friends I have never met them, and they have never met me. And wish them good luck for me. 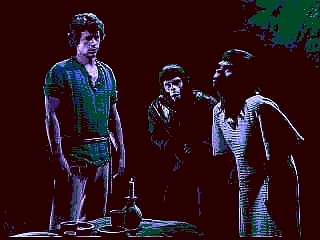 Urko, how did you know the humans olar: OWARDwere lying? I always assume that humans are lying. Makes things easier. Urko and Burke are trapped underground, trying to fashion a make-shift ladder. What you’re doing is human labor—I’m not someone who does human labor. Are you someone who enjoys suffocating? I’ll make an exception in this case. (pointing out a poster to Urko on the subway wall, pretending that apes and humans worked together to invent many things in the past) E.M.—Electro-neurological monitoring. You got something wrong with your head, you hook yourself up, calm yourself down. That’s something you could use, Urko. (to the gorillas helping to rescue Urko and Burke) We can use this girder here as a fulcrum. It’s a way to get the most out of the energy we use. All right, you two (gesturing to the gorilla soldiers) get your horses and ropes over here. No! You’ll stay where you are. I give the orders here. All right, then give them! You! (pointing) get the ropes and you, get the horses. I don't suppose that my word would satisfy you, would it? That I wouldn't say anything? The word of a human? How many times have you lied to me today? (speaking to a gorilla soldier) These humans are dangerous. They stir up trouble. They think they’re as good as we are. Wait. It’s bad enough having humans in the house, but wash first. There’s a smell about you. The lovable Anto is chomping at the bit to get us out of here. Apes do not chomp at bits. Oh, I’m sorry. He’s anxious. (Referring to a repository of human knowledge): Knowledge, death, destruction. In the history of this world, one has been the same as the other. Destroy everything in here. Burn this place to the ground. Wait. What is here would give us great power! The knowledge would be safe with us—we’re not like humans. Would we really be better off, or safer? Remember, once the knowledge in here is set free, it will spread out of control. I will be in control! …most humans do not share your enthusiasm for dying. I promise you, Gahto, I promise you, sooner or later, you will be able to die. In the meantime, stay in the cave! As simple as that. This (holds the flower Galen brought) to remind me, a casual hello…and everything else is forgotten. Kira, a friend of mine has been hurt. You don’t have any friends but renegade humans. Unless you help him he may die. Why should I care if a human dies? If for no other reason than because I care… a very great deal. I don’t know you anymore. You’re a stranger who’s chosen to live with humans! Is that such a dreadful crime? I was thinking about the orderly we sent to disciplinary camp for disobeying orders. Do you think we dealt with him a little bit too harshly? He behaved like an unruly beast. Like an unruly beast, he deserved to be punished. Where’s the harshness? Are humans nothing but beasts? At their best, they’re useful animals. At their worst, they’re carriers of hatred and destruction. This is terrific. What is it, dried mule's hooves? Say, wouldn't have some sauce for a taste killer, would you? (speaking to a silent girl who serves the table) Oh, thank you. I was just gonna ask her name. Her name was taken from her. She is no one. What'd she do, criticize the chef? I will get you that book. With that in your hands, you can advance our medicine. That book is life. If we’re caught, it means death. If we get caught, I’ll confess that I forced you to do this by threatening your life. Do you think I want you to die? No one wants to die, human or ape. We can’t turn back now. We can’t. You think I have some feeling for Galen or for your friend or you? Galen means no more to me than you do. Do you understand that? Humans are nothing. You have no character, no sense of honor, no loyalty, nothing. If they did, you never would have allowed yourself to be brought here. I mean, Galen is risking his life and you can’t even see the danger he’s in because of you… because you are blind and sentimental. And you can’t control your thoughts and your emotions. And you will destroy Galen and your friend. And you will all be destroyed. Diagrams of the circulatory system, surgical procedures… is this a medical text or a book of fiction? You knew the answer the moment you saw it. I can’t believe a human wrote this If Zaius knows about it, why didn’t he let us know? Political reasons. If humans knew they could write books like this, would they be content to be slaves? 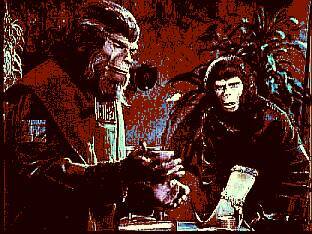 Zaius was afraid that it would be the end of our civilization. I’m a doctor. I have no right to reject the truth. The truth? That book is not truth! That book is treason, that book is madness. That book exists and to deny what exists is madness. Fauna, you must be careful. You can’t trust a love that comes so quickly. Is time any guarantee that a love will be binding? 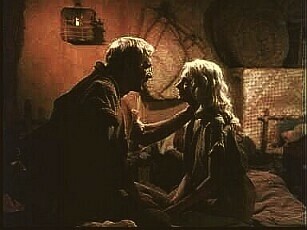 Phoebus, I know it’s asking a lot for him to love someone that’s blind, but do you think it’s possible? No. I do not think that it is possible. I can do anything that a female with sight can do! Except to recognize the truth! He is not an ape—that you can, uh, trust. I don’t believe you. I think you’re the one not to be trusted—you’re supposed to be his friend. He is my friend, but I know him! Virdon and Perdix, the gorilla head of law enforcement in the village, are both on horses. Virdon has a rifle on Perdix, bringing him to the meeting site of the dragoons who have been killing local humans and burning their houses. They stop at the top of a hill, looking down to where the dragoons are supposed to meet. Hi, Fauna. Yeah it’s me, Pargo. Well, I had to talk to you. Did Phoebus tell you what I said to him? Look, um, I think you’re very lovely and gentle There are things about me you don’t even know. Now you sound like Phoebus. Yeah, well maybe you should have listened to him! You tell me—you tell me what is so wrong about you that it surpasses what is wrong with me? Wait, wait, wait, wait, wait. (sighs) You know, this reminds me of a story my mother used to tell me when I was very young. Well, this is a story about an old blind man named Isaac and his two sons, Jacob and Esau. Esau was a hunter, and he was strong and hairy, and his father idolized him. Old Isaac was very sick and on his deathbed, he gave Esau his blessing, which was a big thing in those days. Now the other son, Jacob, had very soft, smooth skin and he wanted his father’s blessing as well. So he pretended to be his brother Esau by covering his hand with a piece of goatskin. And Isaac was fooled into thinking he was touching Esau and he gave Jacob the same blessing. I’m not sure that I understand the meaning of your story. It was a deception, Fauna, born out of desperate need, but not meant to harm anyone. But you couldn’t deceive anyone, Pargo. I have touched your face. It is strong, like Esau’s. If it was soft and smooth, like Jacob, I should fear and despise you. Fauna, you must understand there is nothing between us, and that there can never be. My friends are going to leave here today and you’ll never s—you will never hear my voice again. Burke hands Fauna her father’s journal. Virdon and Burke rescue Fauna from drowning and carry her back to shore together. Fauna, Fauna, it’s all right now, it’s all right. No, you’re not Pargo, you’re human! It was a deception, born of desperate need, Fauna, not meant to harm. Get away, get away from me! Fauna, Fauna, this is your Uncle Sestus, nothing to be afraid of. But he’s human, he’s human! It’s all right. He’s not going to hurt you. Get him away, get him away… he tricked me, he tricked me, like the others tricked my father. They’re treacherous! They’re like animals and they must be treated like animals. Fauna, now listen to me. This human saved your life. He risked his own life to save you. I hate him, I hate him. A human killed my father, he killed him. Fauna, it’s Alar, listen to me please. I don’t know if a human did kill your father, but if it happened, that doesn’t mean all humans are bad. Just like all apes aren’t good. Relax. After all, it’s only a horse race. With half my horses and half my land bet on the result. Well, think how rich you’ll be if you win. If, if, IF! You insist on the race, you make all the arrangements, you demand the bet. Have you ever lost a race to any prefect? …well, better luck next year. Urko’s horse throws a shoe. The Prefect’s horse passes him and wins the race. (exultant) There is a first time! I never talked to an ape before. I mean, they talked at me, you know, given me orders, things like that, but never just like you and I are talking, saying things you feel like saying. Would you believe it was many years before I spoke to a human, except for giving orders? Why should apes give orders? Why do we have to obey? Well, there are two answers to that—mine and the authorities. Seeing mine isn’t backed up by bullets, I think you should listen to the authorities. An ape of my wealth and position with two human servants, walk? I can borrow a horse, can’t I, Martin? The psychological method of washing out of the human brain old ideas and replacing them with new ones. And that’s what we’re going to do with Burke! Ah, yes, I seem to remember hearing something vaguely about that. Brainwashing. Is that when you take the brain out of the skull and wash it with cool water? No no, you don’t take the brain out of the skull! You don’t take the brain out—well how can you wash it when you don’t take it out of the skull!! 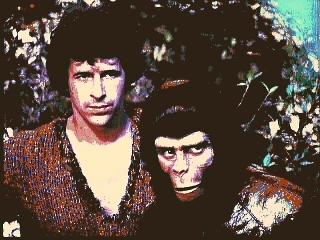 You have a contempt for apes, Burke. You’ll change your mind before you’re finished. I have no contempt for apes, nor for any other thinking animal on this planet. I can see your mouth moving but I can’t hear anything you’re saying. All those bells and drums are too loud, they’re deafening me. If they’re too loud now after four hours, think how they’ll sound after eight hours. What, can you talk louder? After twenty-four hours. (to the gorilla soldier standing behind her) Lieutenant. Shoot. Hold it. You gotta be kidding. I’m quite capable of it, Burke. Obviously you can hear when it suits you. (Galen's father) He is a human. I am an ape. He is my enemy. Your friends are humans. Strange friends for a chimpanzee. Not if you know them. You’d respect them, too, if not for your stupid prejudices. I am older than you. Perhaps those so-called stupid prejudices are based on reason. No they are not. They are based on custom and on habit. And you know it! Even if I agreed with you—and I don’t—do you think you can change the whole world? You understand I promise nothing. This operation is still in the experimental stages. I can’t guarantee success. The patient survives and is docile. The patient can die or worse, be left with no brain at all. just enough food to stay alive. I won’t be nothing. That letter was taken from the assassin he hired. (attempting to persuade Urko he is telling the truth about Aboro) I don’t ask you to believe me. Can’t you believe your own ears and your own eyes? I do. I see you, I hear you and I know you are enemies of the State and you will be executed. Execute, shoot, kill!—I am so tired of the kind of solutions you find for all problems. A human to see you, sir. He says it is very important. A human, important? What could be important about a human? (to Aboro at his arrest) Bribery, corruption, conduct unbecoming to an ape. You’re finished, Aboro, finished. Why don’t you stay—make your home here? That's a good question. I guess the reason is that Virdon’s got an itch in his feet and I got rocks in my head, which is why I go along. You see, we’re taking a survey of the far side of every hill on the horizon. I’d like to give you a better answer. But I can’t think of one. What’s the matter Galen, you hear something? What is this, crystal ball time, let us in on it! What’s the matter, Galen, something’s bothering you. You are. I didn’t like what you did. When I joined up with you two, I knew that I would have to face the same dangers that you face. 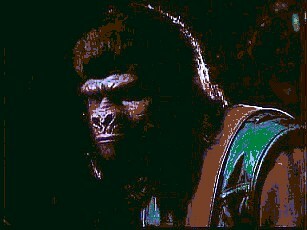 In fact, Urko has probably told his gorillas that I am first priority on his death list. With my own people, I’m a renegade. I accept that. But I did think at least that we would try to protect each other. Hey, who’s not protecting what, or did I miss something? I still don’t know what it is. If you tell me what it is, I’ll try to correct it if I can. You can’t put water back into a broken bottle. Time and time again, you have cautioned us we must be very careful not to tell anyone about ourselves. You told her who we are. Not only did you trust her with your life, but you trusted her with ours. You’re right, Galen. I shouldn’t have told her. She was hurt and I wanted to try and make her understand why I couldn’t stay. That’s not an excuse. I’d just like you to know why. I’m truly sorry. I didn’t think you meant any harm. It just seemed like such a needless risk to take. It was. Chalk it up to the fact that I’m only a human. (contemplating) Oh, yes. Sometimes I forget that humans can’t help the weaknesses they have. Just because that girl is in love with you, should I risk my life by going back there?! No. There’s no reason at all. And should you risk your life? I am getting to be no better than a human! (to Zoran, ape doctor) You’re whistling Dixie, Doc. Whistling. I—shall––speak—more—clearly. You still hear whistling? Is there something wrong with your ears? Maybe we could get away before Urko has guards posted everywhere. But you won’t. And you, Pete? I know it sounds silly, Galen, it does sound silly. Sounds so silly I won’t even say it. You know the answer. I know the answer. I knew the answer before I asked. I always knew the answer. I always disagree and I (sighs) always go along. Maybe I’m sick in the head. Urko, this disease is fatal to our people. We should use this situation to develop a cure. Yes. Perhaps there’s a positive side to this. We can experiment with the humans. Even if we lost an entire human village, if an ape cure was developed, it would be worth it. Now we’ll see, Doctor, now we’ll see if the Council still believes in you. This village will burn and everyone in it. Everyone! Urko, I sometimes wonder which you fear most, death or a few words of reason! Urko rides to the village with his soldiers carrying torches. Stand aside or die with the others in the village. That is treason, Urko. I command you to withdraw. You command! You have words. I have weapons. Would you kill me, Urko? Before I allow you to let him (Dr. Zoran) kill my troops… yes! The sick villagers come out of their homes and move together as a crowd in mute testimony of the treatment’s success. No! The medicine made me better. It saved my life, Urko! Urko, I tell you again, take your troops and withdraw while you still have them to command. If we’re lower, how come we’re smarter? I had no other choice. I have my position to uphold. 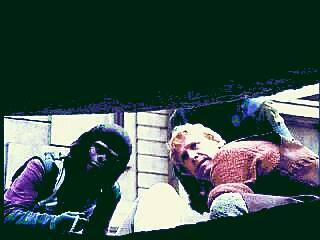 You turn us in, you think we won’t tell Zaius? (laughs) He’d never believe you. (laughs back) He’d believe me. Very well, Galen. You may leave. Oh well, you see, where they go, I go. If they stay here, I stay. Well now Zoran, you’ve got a decision to make. Your loyalty or your ego. Ego... I’m not familiar with that word. Just how are you going to feel, Doctor, when Zaius finds out that you were counseled by humans—every move you made, every word you spoke? right by the house I lived in in Central City. You better can it, little chimp. You're gonna be crying in a minute. I know, but I can’t help it sometimes. I’m with you, Galen. Pete, if you’ve developed a vaccine against the memories, give me a shot of it. Well, of course I’ve got a patented cure. See, if you lose one home, you try to find another one. Preferably where the natives are friendly. There’s something very special about Brun. and it isn’t just that mask he wears, either. He’s… if chimpanzees were ever afraid, and if humans were what they were afraid of, I can tell you that is a human to fear. It’ll do you no good to resist. Listen to me, Miro. You’re only hope is to fight against the gorillas, not with them. Let us out and we’ll fight alongside you. Cut us loose and we’ll take the first crack at it, you can join in. You are not being given to the gods for several days. To cut logs. You must be made strong. The gorillas will not accept the weak. That’s like asking a turkey to sharpen the ax before Thanksgiving. (chopping wood) Miro’s going out to hunt humans, isn’t he? Too bad they don’t have antlers. He could have one stuffed for the wall in his den. Talia, do you realize that makes you no better than the apes? Both of you hunt humans and then make them into slaves. That’s not true. We don’t take slaves for ourselves. They’re still slaves, can’t you see that’s wrong? No matter what I did, apes cannot be imprisoned by humans. It’s unnatural! What would you do if one of the meadow people grabbed Talia and tried to run off with her? I would stop him. I would kill him. But a human does not fight apes. The apes are not gonna treat her a whole lot better than they are now if you’ll stand up to them. Why won’t you stand up to the apes? They’re wrong, Miro. They don’t understand. She’s right, you don’t understand. All right now, listen to me. Men have had to fight for what’s important to them since – well, since longer than you can imagine. The only way they’ve been able to make a decent life for themselves is by burying their differences, by banding together. A human cannot fight apes! The gods made apes the rulers of men! Talia, come. Miro, you didn’t listen to a word that I said! You are trying to put lies in my mind. You’re telling me to question everything that has ever been what was meant to be by gods and apes! You can’t reach these people, they just roll over and play dead. I want Talia! You teach your secrets to someone else. In time, you will change. (bitterly) Is that a new law? A very old one. A son will honor his father. I did honor my father. I never stopped loving my son. The gorillas come tomorrow. If I set you free, will you take Talia with you? Their god wears a gas mask. Their god is a gas mask. My mask came from the gods. No, it was made by men when they destroyed other men with gas like this. No he is not lying. He knows about such things. When I get enough, I will go to the ape village. My mask will protect me, but they will be killed. You can’t use this gas. You can’t control it. You can start by killing apes but you can wipe out the whole planet. 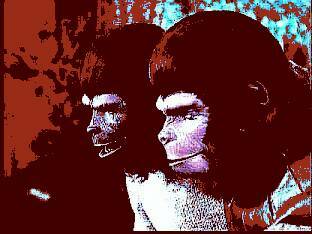 All our lives, we have obeyed, begged, and crawled, and gave up those we loved because the apes were strong. Now the gods have made me strong. I will free my people. Not this way. You can’t win freedom by destroying the world. I will teach them to make masks like yours. 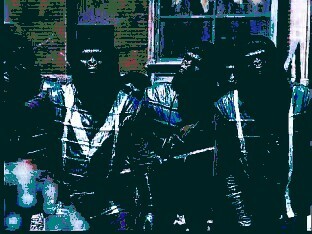 We will fight the apes again! The gas will kill them but the masks will save our lives. Man, this poison gas of yours is just the beginning. Sooner or later, the apes will find their own gas and they’ll make their own masks. Listen, please listen. We’ve been all through poison gas, germ warfare and atomic bombs. When you use them nobody wins! Do you side with the apes? That’s not the point. Fight to stop slavery, all slavery, but not this way. We will kill only apes and we won’t stop in this valley. As long as it won’t kill my people, nothing else matters. You certainly picked a classic way to settle an argument. Do you think he’s gonna be fonder of apes when he comes to? I’m not quite sure that’s the right word for me. There’s nothing worse than strength and authority without intelligence. (referring to a gorilla soldier who beat Leuric) Get out of here. (to Leuric) I’m so sorry. Apes are not sorry for humans. I know she wants to protect him (Leuric). Yes… she’s that kind of ape. Hey, hey, you getting a little hung up there on her, huh? If you mean what I think you mean, I think you are jumping to premature conclusions. Which may be correct. 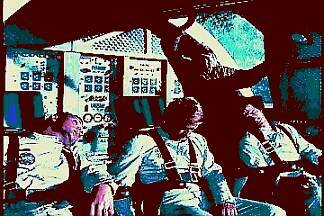 If you tied me to that thing (the glider), kicking and screaming, I would find some way to keep my feet on the ground. It’s got to be tested before we take it apart and try to get it to Leuric. Yes, and I intend to watch one of you test it, and I shall applaud enthusiastically if you are successful. What would happen if an ape looked up and saw a human flying? Well, he would shoot the human down. Right. You’re hanging up there on a glider, there’s not a lot of places to hide, right? Right. If an ape looked up and saw another ape flying, he might get shook up, but he wouldn’t shoot. He is not going to get shook up because he is not going to see an ape flying. Galen, you gotta do it. It’s you or it’s alas, poor Leuric. Save your breath. It’s out of the question! I refuse! I absolutely put my foot down! (on the glider with Galen) I made it happen. What nobody ever did before! You also may be killed the way no one has ever been killed before. (on a raft, escaping with Leuric, Burke and Virdon) Oh please, somebody shoot me. Ancient human disease. Sea sickness.